The risk of a “disorderly” Brexit has never been higher, the EU’s chief negotiator has said, following MPs’ second rejection of Theresa May’s deal. Michel Barnier said the EU “cannot go any further” in trying to persuade MPs to back the agreed terms of exit and the UK had to break the impasse. He questioned what the purpose would be of extending the talks beyond 29 March. Wednesday’s vote only applies to the 29 March deadline and would not rule out the prospect of a no-deal exit later this year, if Parliament is ultimately unable to agree a way forward. Ahead of the no-deal Commons vote, the government announced that most imports into the UK would not attract a tariff in the event of a no-deal Brexit. As the government considers its next move after Mrs May deal was defeated by 149 votes, Mr Barnier said it was time for the UK to take “responsibility” for its actions. “Again the House of Commons says what it doesn’t want,” he told the European Parliament. “Now this impasse can only be solved in the UK. The EU, he suggested, had gone “as far as it possibly can” to satisfy MPs’ concerns over the agreement, particularly in relation to the backstop, an insurance policy to stop a hard border on the island of Ireland. “If the UK still wants to leave the EU in an orderly manner, this treaty is, and will remain, the only treaty possible,” he said. What are MPs voting on later? MPs will vote on a government motion, which says the Commons “declines to approve leaving the European Union without a withdrawal agreement and a framework on the future relationship on 29 March”. Mrs May, who is currently chairing a cabinet meeting, has said Tory MPs will get a free vote. That means ministers and MPs can make their own mind up rather than following the orders of party managers – an unusual move for a vote on a major policy. The no-deal debate will begin after Prime Minister’s Questions and Chancellor Philip Hammond’s Spring Statement economic update. Leaving the EU in 16 days’ time remains the UK’s default position under the law, unless talks are extended. If a no-deal exit is rejected, MPs will vote on Thursday on delaying Brexit by extending Article 50 – the legal mechanism that takes the UK out of the EU. The EU has said it would need “a credible justification” before agreeing to any extension. Such a move would have to be agreed by every member state. 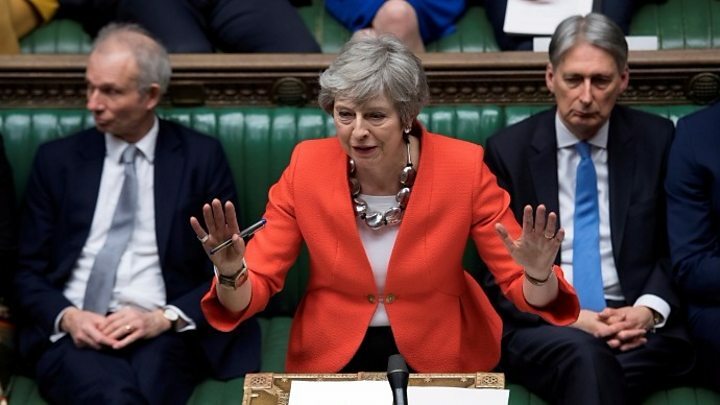 The PM had made a last-minute plea to MPs to back her deal after she had secured legal assurances on the Irish backstop from the EU during late-night talks in Strasbourg on Monday. Speaking after the defeat, she said MPs would have to decide whether they want to delay Brexit, hold another referendum, or whether they “want to leave with a deal but not this deal”. 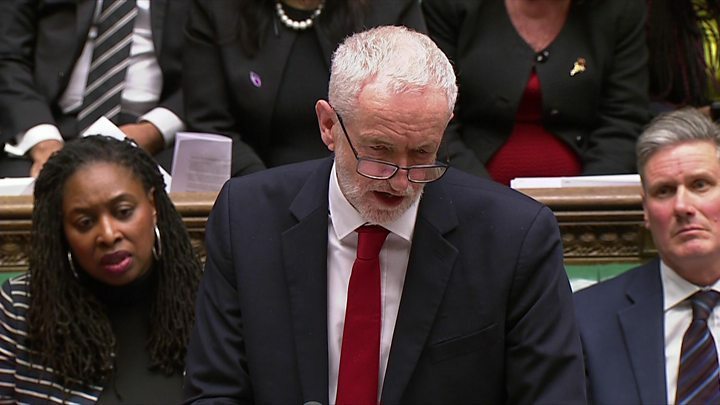 Labour have said the prime minister’s Brexit deal is now “dead”, while Conservative Brexiteers and Remainers have also called for alternatives to be seriously discussed. Despite Tuesday’s defeat, the BBC News political editor Laura Kuenssberg said, there were ministers who believed it could still ultimately prevail as other options gradually fell by the wayside due to lack of parliamentary support. What alternatives are being discussed? Labour wants no-deal to be “taken off the table” and is likely to back an amendment – a legislative tool – tabled by MPs Jack Dromey and Caroline Spelman ruling out the UK leaving without an agreement at any stage in the process. Shadow business secretary Rebecca Long-Bailey told the BBC that Parliament would increasingly “set the agenda” if the government was not in control of events. She said No 10 should consider giving MPs a free vote on the full range of options for the UK’s relationship with the EU – including Labour’s own plans for a customs union. Among other proposals which could be discussed on Wednesday is a plan for the UK to leave without a formal agreement but with a number of safeguards to minimise economic disruption. The plan, known as the Malthouse compromise, is backed by Brexiteer members of the European Research Group of Tory MPs, as well as the DUP and former Remain ministers like Nicky Morgan and Damian Green. It would see the controversial backstop replaced by alternative arrangements, an extended pay-as-you-go transition period and a series of “standstill” arrangements for various industries until the end of 2021. Amid reports Brexiteer ministers have been granted a free vote on this proposal, Tory MP Steve Baker told BBC News the plan – which would see Brexit delayed until 22 May – was “eminently reasonable”. But Tory former minister Nick Boles said this would amount to a no-deal exit and the EU would not agree to it. What would UK do in no-deal scenario? The government has set out more details of what it would do to attract trade and protect businesses in the event of the UK leaving the EU without an agreement. Under a temporary scheme 87% of imports by value would be eligible for zero-tariff access – up from 80% at present. Tariffs would be maintained to protect some industries, including agriculture. Confused? Tell us what you would like to know about Brexit and what happens next.